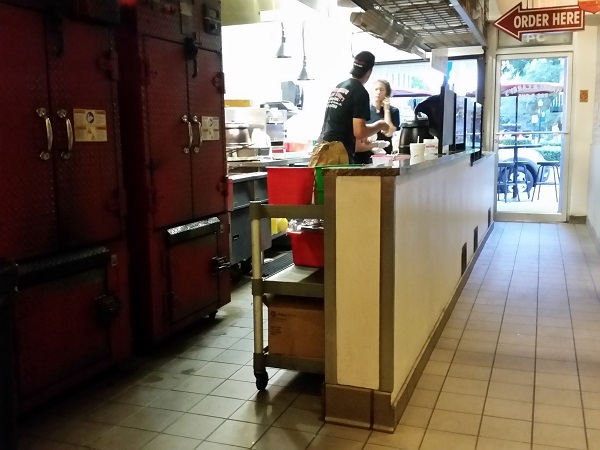 Harry and Larry’s Bar-B-Que, Winter Garden FL – Marie, Let's Eat! We’d been bumming around Orlando for many hours, wasting a fair chunk of them in traffic, and it was getting a little late as we made our way to the last restaurant on our list. 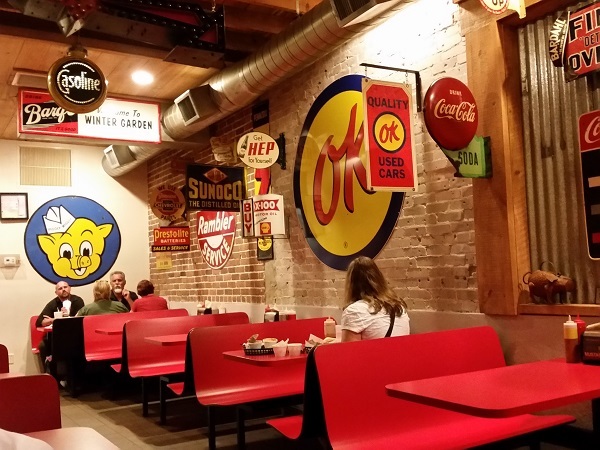 Now, my original hypothesis had been that barbecue in Florida must be very heavily influenced by each restaurant’s proprietor’s hometown style. Ah, what a silly error that was to make. I totally overlooked that thousands of people are actually born in Florida and grow up here; they don’t just retire to the Sunshine State. Take Ashlee and Katie Grimes, for example. They’re sisters whose family has lived in central Florida for four previous generations, and they’ve grown up smoking barbecue not far from Orlando. In the 1990s, Winter Garden was apparently like many other older suburbs, a little stretch of sprawl whose downtown was decaying. Time and the weather – a monsoon fell on us as we finished our meal – conspired against us really looking around, but what Winter Garden’s city fathers did in the late 2000s looks amazingly impressive. It’s one of the nicest small downtown renovations that we’ve ever seen, with pedestrian-friendly streets, boutiques, performance spaces, lots of simple and attractive brickwork, and a few locally-owned restaurants, like this one, which opened in 2009. 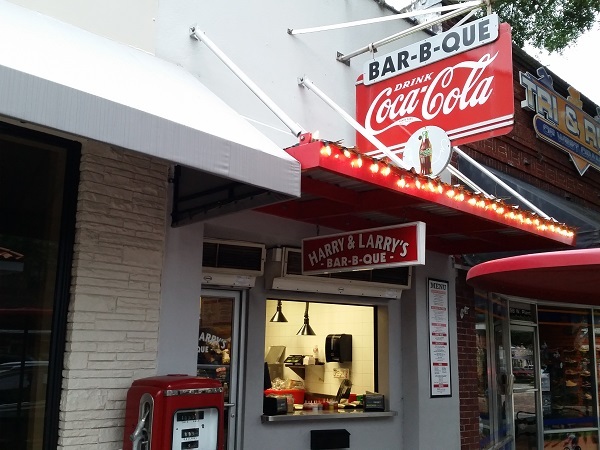 The owners named their restaurant Harry and Larry’s in tribute to their grandfathers, moved in a pair of red J&R smokers – I think that they are “Little Red Smokehouse” models – and have been enjoying pretty good crowds. In fact, the crowd situation can demand a little patience from guests at crunch time, as their small and narrow space creates a logjam right in the doorway, so your party might need to wait outside until the group ahead of you has ordered and gone on to take their seats. Despite the Grimes’ deep roots in this community, there seems to be a little bit of Texas in their menu. The main meats that they smoke are pork, sausage, brisket, and turkey. 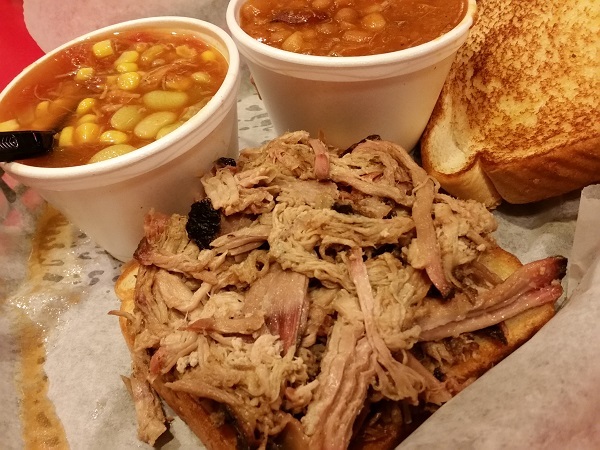 They also offer St. Louis-style ribs, and the sides include an amusingly-named “Q stew.” It’s just as well that they didn’t call it Brunswick stew, as I have one or two opinions about that. For all I know, Q stew should be full of potatoes and lima beans. Heaven knows that Brunswick stew should not! The pork was really quite good, full of flavor and moist enough to not really need sauce. I believe there were four available, mostly the expected variety of thicker tomato-based sauces, but there was a pretty darn good hot mustard sauce as well. Not too hot and not too potent – the powerful and painful mustard at Dennis’ in Hephzibah GA was still pretty fresh in my mind – this blended excellently with the pulled pork, and a few drops also enlivened the stew. Marie was also very pleased with her pork and we enjoyed kicking back for a short time as the rain got worse and worse. This resulted in that amusingly awkward situation at restaurants where no more guests are arriving and nobody actually wants to leave, so we enjoyed a nice chat about the revitalization of Winter Garden with one of the employees who takes some justifiable pride in how great her town looks, and how this hole-in-the-wall space is bringing in tourists to try some of the region’s best barbecue. Finally, though, we had to decide that we were late enough, and while my mother enjoyed spending the day with her grandson, we really had taken advantage of her for quite long enough. I stomped back through the deluge, pulled the car around, picked up everybody and sniffled and sneezed my way back to Apopka. There, I threw my clothes in the dryer and went to bed! Posted on October 18, 2015 August 23, 2017 by Grant G.Posted in barbecue, florida, orlandoTagged barbecue, florida, orlando, winter garden.